That “leaked” Alfa Romeo GTV photo isn't the real deal. We’ve been eager to see the new GTV sports car and 8C mid-engine supercar ever since Alfa Romeo announced the return of these iconic models last year. While no concept cars previewing these models were shown at this year’s Geneva Motor Show, a photo posted by an Italian website this week allegedly showed the new Alfa Romeo GTV during an internal company presentation before we were supposed to see it. The source of the photo wasn’t known at the time, but an Alfa Romeo company spokesperson has since reached out to us to clarify the situation. Sorry Alfa Romeo enthusiasts, but this isn’t the real deal. It turns out the GTV shown in the photo is a render from a student design project at the School of Design in Milan. More photos from the presentation were shared by teacher and former Alfa Romeo designer Michele Leonello on Instagram, showing the hypothetical GTV from other angles. We certainly hope the final production car looks as good as this, as the render looks like the sporty Alfa Romeo coupe of our dreams. Essentially, the new Alfa Romeo GTV will be a coupe version of the Giulia sedan. 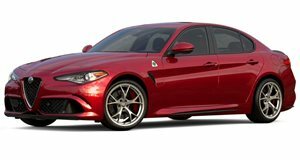 Like the range-topping Giulia Quadrifoglio, it will reportedly be powered by a 2.9-liter V6 engine. Unlike the Giulia Quadrifoglio, reports suggest the new GTV will have a hybrid powertrain with a combined output of around 600 hp and an electric range of 30 miles when running in EV mode. While its predecessor was only available in front-wheel drive, the new GTV is expected to be available with rear- or all-wheel drive. Alfa Romeo hasn’t released any official technical details for the new GTV yet, and the sports car isn’t expected to be unveiled until 2021 and go on sale the following year according to the company’s product roadmap. Let’s hope Alfa Romeo creates a gorgeous GTV concept previewing the production car to whet our appetite before then.